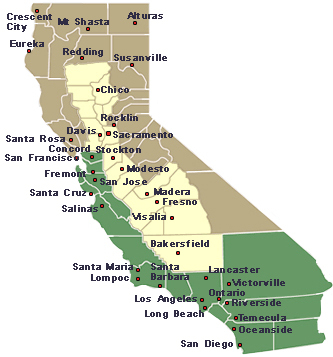 Council members serve many areas in California. Click on the area links to the right, the map above, or scroll down to find help in your area. We can provide you contact with various elder care services in Northern California. Although this area is temporarily without a member to assist you we can still help you solve any concerns or problems you may have. Please contact the California Care Planning Council by clicking on the link below. We can provide you contact with various elder care services in the Sacramento Area. Although this area is temporarily without a member to assist you we can still help you solve any concerns or problems you may have. Please contact the California Care Planning Council by clicking on the link below. We can provide you contact with various elder care services in Central California. Although this area is temporarily without a member to assist you we can still help you solve any concerns or problems you may have. Please contact the California Care Planning Council by clicking on the link below. We can provide you contact with various elder care services in the Monterey Bay Area. Although this area is temporarily without a member to assist you we can still help you solve any concerns or problems you may have. Please contact the California Care Planning Council by clicking on the link below. We can provide you contact with various elder care services in Santa Barbara / San Luis Obispo. Although this area is temporarily without a member to assist you we can still help you solve any concerns or problems you may have. Please contact the California Care Planning Council by clicking on the link below. Here at BlueSea Care we take pride in more than just providing home care services. Its about giving you the tools to live a healthier, longer life. With a 10 year history in permanent and temporary home care staffing , we are committed to finding and placing superior caregivers on an as-needed, part time or full time basis. We provide friendly, helpful individuals to bring comfort to your Love one in need of assistance in every aspect of our services, from companions and homemaker helpers to case management specialist. Call today,(800) 562-2734 for a free assessment, meet our care manager face to face while discussing your unique situation of care needed, level of skill required, preferences, likes and dislikes and determine the cost of care. All options for payment are considered, from VA aide and attendance benefits to any long term care insurance which may help pay for care at home.